Managing Design for Success of Building and Infrastructure Projects worldwide is foremost on the minds of most Owners, Developers, Government Agencies, Project Managers, Design Managers, Design Consultants and Design & Construct Contractors. Design Managers working directly for the Owner or Developer, Government Agency, Project Management Groups, Architectural or Engineering Design Consultants or Design & Construct Contractors can now have access to online courses, resources and tools specifically tailored for design managers as noted above to help you to successfully manage the design of your projects and achieve a successful outcome for your Client and your own company's business. Guidance and steps are also included for Architects and Engineers in winning the consultancy work or D&C Contractors winning Tenders using well structured and defined design management. All the above is included in the MDfS Design Managers Club. If you are interested to learn about the Managing Design for Success (MDfS) Design Managers Club please visit the Club Page here. 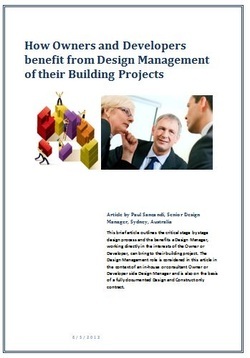 If you are interested to purchase a Design Managers Manual 120 Steps Design Management Manual please visit the Design Managers Manuals Page by clicking here. If you are interested to purchase a 120 Tips for Managing Design Booklets please visit the Booklets Page by clicking here. My Online Courses, Managing Design Tools, Resources and Booklets are the result of over 33 years of my experience in managing Building and Infrastructure designs. I have a solid technical background as a structural engineer, previous owner of an Architectural and Engineering (A&E) practice and have worked in Australia, Asia and the Middle East on a wide range of small to “mega” projects. I am now practicing as a Senior Design Management Consultant. I am seeking to share my knowledge, experience and expertise on Managing Design of Building and Infrastructure projects.